This elegant folding lid gift box for a single Small Guardhouse or A sized Air-Tite coin capsule is packed with tons of great features! The lid of this box folds over the base and snaps into place using a magnetic closure. Inside the coin capsule rests in a velvet covered black insert. The insert has a easel tab which can be pulled out, allowing the insert to be displayed standing up inside the box. This elegant folding lid gift box for a single Medium Guardhouse or T sized Air-Tite coin capsule is packed with tons of great features! The lid of this box folds over the base and snaps into place using a magnetic closure. Inside the coin capsule rests in a velvet covered black insert. The insert has a easel tab which can be pulled out, allowing the insert to be displayed standing up inside the box. This elegant folding lid gift box for a Extra Large Guardhouse or I sized Air-Tite coin capsule is packed with tons of great features! The lid of this box folds over the base and snaps into place using a magnetic closure. Inside the coin capsule rests in a velvet covered black insert. The insert has a easel tab which can be pulled out, allowing the insert to be displayed standing up inside the box. Made in the USA, this stock box is available in black or blue velour, velvet or leatherette and holds a large Guardhouse capsule or Model H Air-Tite capsule. This box has a similar design and exterior dimensions to U.S. Mint boxes that hold raw Silver and Gold Eagles. 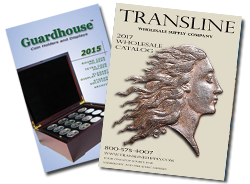 Guardhouse slim coin display boxes also available adorned with silver rims and additional features, including custom printing. Please call for more details. Sleek, blue velour box ideal designed to hold the Guardhouse 1 oz bar capsules. These boxes are made in the USA. Velvet display box for 3L capsules. Velvet display box deisgned to hold 2 h and/or L capsules. Sleek, blue velvet, metal construction coin box with coin display insert. The specially made Guardhouse box insert will display the coin flat or at a slight angle for quick viewing. The Guardhouse single coin box is ideally designed to hold any 2 inch coin or coin capsule, including the Model I Air-Tite coin capsules. The size, extra large, refers to the size of the insert, which is 2 inches, or 51mm. Actual coin box size is 2.5x2.5x1. Made in the USA. Sleek, metal shell box available in leatherette, velvet or velour. Insert is designed to hold one extra Model X Air-Tite capsule. These boxes are made in the USA.